CardMonkey's Paper Jungle: Christmas is coming -- See companion website! Hop on over to CardMonkey's companion blogsite, to see the 100 cards being made as we Countdown Til Christmas. After mounting sub-frames of red, green and white cardstock atop a 5 x 6.5" premade card, I cut a candy cane from gleaming red cardstock. 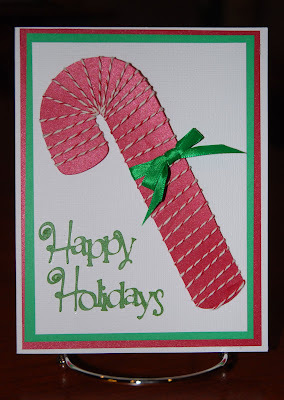 In this case, I used a candy cane found in the User's Gallery of "Make the Cut." I then wrapped the candy cane in red/white striped baker's twine that I purchased recently. I found the twine in red/white, green/white, brown/white and blue/white, and bought cones of each at a reasonable price. (It works out to $0.005/yard -- a half-a penny per yard! To compare, when Martha Stewart was selling baker's twine, she was selling 60 yards for $3.98 MSRP. That's six-and-a-half cents per yard! That product has been discontinued, though.) The sentiment was cut from Cricut's "Joys of the Season" cartridge. Be sure to visit the North Pole Cards blogspot to see how you can get in on the GREATEST CHRISTMAS BLOG CANDY giveaway!